Come stop by for Donuts either pool on your way to work. We will start serving at 6am. This event is being rescheduled due to the construction around the lake. Stop by either pool on your way home from work for a dominos pizza for your family! Don’t worry about cooking tonight, we will begin serving pizzas at 5:00. One pizza per household. Neighborhood Pool Party! Come celebrate the pool opening with us from 12-4pm with food, drinks and games! We have attached the annual meeting packet and presentation for you. There will be limited prints available at the meeting to save on printing costs. We look forward to seeing you tonight at the Cross Oak Elementary School at 6:00 p.m.
Our annual meeting and board election are coming soon on December 5, 2017 at 6 p.m. at the Cross Oak Ranch Elementary. Online voting has been made available for all residents. You may register and vote online at crossoakranchhoa.ivotehoa.com. We have some wonderful candidates running this year. Click on the links to the documents below to read their bio’s. If you wish to vote by proxy or by mailing in your absentee ballot we’ve attached the form for you below as well. This is reminder about the upcoming board meeting on Tuesday November 14. The meeting starts at 6:00 p.m. at the Oak Grove Methodist Church on 4725 FM 720, Aubrey, TX. This meeting will start out in Executive session first and then go into the open board meeting at 7:00 p.m. You may arrive at 6:00 p.m. but the general open session does not start until 7:00 p.m. In an effort to save on printing costs we are only making homeowner packets available electronically. We have attached the homeowner packet below. Please note that this is a business meeting. As a homeowner, you may attend and observe only. Please read the Meeting Decorum document contained with the homeowner packet. Any questions should wait until after the meeting and/or can be sent in directly to the management company. You may send in your questions to contact@spectrumam.com. Recently three board members resigned from their position on the Cross Oak Ranch Board. In order to fill those vacancies the remaining Board of Directors for the Cross Oak Ranch Homeowners Association has scheduled a regular meeting. The subject of the meeting is to fill vacancies on the Board of Directors and the Architectural Control Committee. The fall semi-annual community garage sale will be on Saturday September 30, 2017, the hours being from 8am until 2pm. We are encouraging all residents to participate, that includes renters and homeowners alike. You can setup in your garage, driveway, or yard. If you have a business or hobby, we encourage you to display and sell as well. If you love to bake or make lemonade, you will be a hit with the bargain hunters. We will be advertising the community garage sale, so expect a good turnout. The spring sale drew 100’s of bargain hunters into the community. 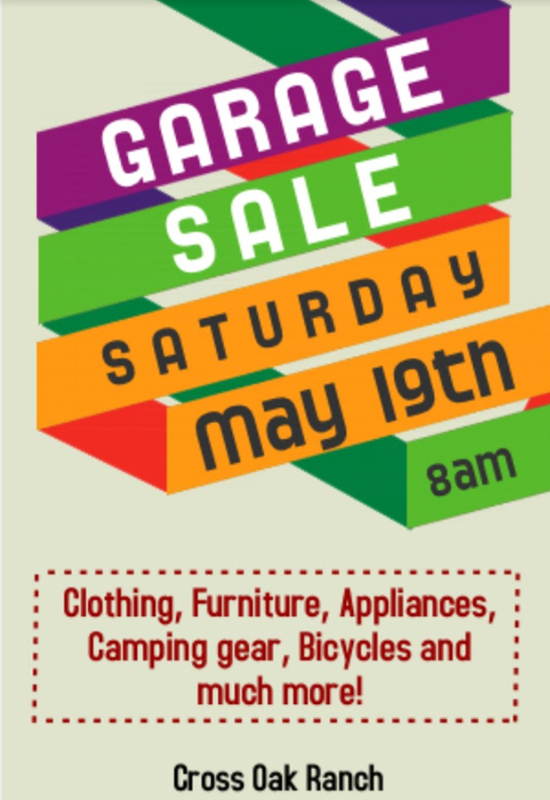 We would love for our community garage sale to be the event both residents and bargain hunters look forward to. We will be discussing the upcoming Road Powers Bill, which will be up for vote during the November County Elections. Please come join the conversation in preparation for your vote. Click here to download and read the MUD 4_5 Road Powers Annou. The focus of the board meeting is general business of the Association, which may include the Association’s budget, financials, and day-to-day operations. Topics usually discussed in executive session include personnel, community maintenance, contract negotiations, vendor relations, pending litigation, enforcement actions, and communication with the Association attorney regarding matters that are confidential by request of an affected party and the agreement of the Board. Per request of homeowners (according to Article IV., Section 2 of the By-Laws of the Cross Oak Ranch Homeowners Association, Inc.), a Special Meeting and Vote to Remove one or more members from the Board of Directors has been scheduled. This meeting will be held on Thursday, August 17, 2017, at 7:00 p.m., at 4725 FM 720 West, Aubrey, TX 76227. 1. To vote to remove existing HOA Board Members. Online voting has been made available for execution of the petition. Please follow the instructions for voting online at https://crossoakranchhoa.ivotehoa.com. This option will only be available from Monday, July 24, through Thursday, August 17, at 5:00 p.m. All proxy or absentee ballots MUST BE RETURNED by 5:00 p.m. on Tuesday, August 15. Managing Agent for Cross Oak Ranch Homeowners Association, Inc. 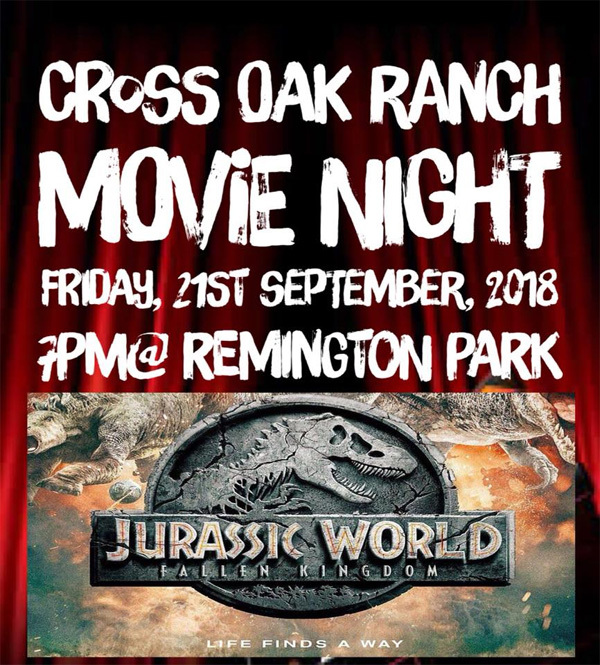 Neighbors come out and join Cross Oak Ranch Social Committee for fun in the park. July 8,2017 2:00pm-4:00pm. Support your HOA by being a part of the solution. The swimming pools will be open for business on Saturday May 27th. We had hoped to have the pool open on Thursday May 25th, however construction in the pool area is not complete. The pool coping is being replaced to insure the safety of all residents. All homeowners are welcome to attend and observe the meeting. Bring your cameras to take pictures with the Easter Bunny! All homeowners are welcome to attend and observe the meeting. If you would like to be placed on the agenda please contact Lynsey Huber at lhuber@Spectrumhoa.com. Meeting will be called to order and will immediately adjourn in executive session. Come meet your new Board of Directors and fellow neighbors. CROSS OAK RANCH HOA IS HOSTING A COMMUNITY MEET AND GREET! SPONSORED BY JUSTIN HENRY, REAL ESTATE & FORTUNATA WINERY. Due to Agenda items being changed from what was originally posted, the meeting scheduled for this evening has been cancelled. A new notice of meeting and agenda will be posted and sent to homeowners who have registered to receive email communication. A public hearing has been set for February 21st at 9:00am by the Commissioners Court. You may view the agenda and other public hearing documents by clicking on the link below. Cross Oak Ranch Board of Directors will hold the January Board Meeting immediately following the Annual Reconvene Meeting onTuesday, January 31, 2017 at 8:00pm. We are pleased to advise you of the Annual Reconvene Meeting to be held on Tuesday, January 31, 2017. The purpose of this meeting is to conduct normal business of the Association and present information on current Association affairs. The Reconvene meeting will proceed on the date indicated above. The reduced quorum required to hold the meeting has been met through the submission of proxies. Check in will begin at 6:30 p.m. We are looking forward to seeing you on January 31, 2017. If you have any questions please feel free to contact our office at (972)428-2030 or by e-mail at contact@spectrumam.com. We are pleased to advise you of the Annual Reconvene Meeting to be held on Thursday, January 12, 2017. The purpose of this meeting is to conduct normal business of the Association and present information on current Association affairs. Enclosed for your convenience is a proxy that can be used in the event that you are unable to attend the meeting. A meeting cannot be held unless quorum is met in person or by proxy. If you have not submitted a proxy and cannot attend the Reconvene Meeting, please consider submitting your proxy today. All proxies previously submitted on behalf of the Annual Meeting held December 14, 2016, remain valid and will be counted toward the quorum needed. Time:	7:00 p.m. – 8:00 p.m. Check in will begin at 6:30 p.m. We are looking forward to seeing you on January 12, 2017. If you have any questions please feel free to contact our office at (972) 428-2030 or by e-mail at contact@spectrumam.com. We are pleased to advise you of the Annual Meeting to be held on Wednesday, December 14, 2016. The purpose of this meeting is to conduct normal business of the Association and present information on current Association affairs as well as electing five (5) officers for the Board of Directors. Enclosed for your convenience is a proxy which can be used in the event that you are unable to attend the meeting and a candidate form if you are interested in running for a position on the Board. It is very important that you assign your proxy if you cannot attend. If you do not wish to assign it to a specific neighbor to vote on your behalf, you may mark the box next to the following statement, “Proxy for quorum only (Not assigning vote).” Please see enclosed proxy for more information. Check in will begin at 6:30pm. We are looking forward to seeing you on December 14, 2016. If you have any questions please feel free to contact me at (972)428-2030. SNOW is making an Appearance at Cross Oak Ranch! Snow slide will be located near the Liberty St. Bus stop across from the Elementary School. Bring your family for tube rides down a real ice slope. Other activities will be horse drawn carriage rides, trackless train rides, and face painting. 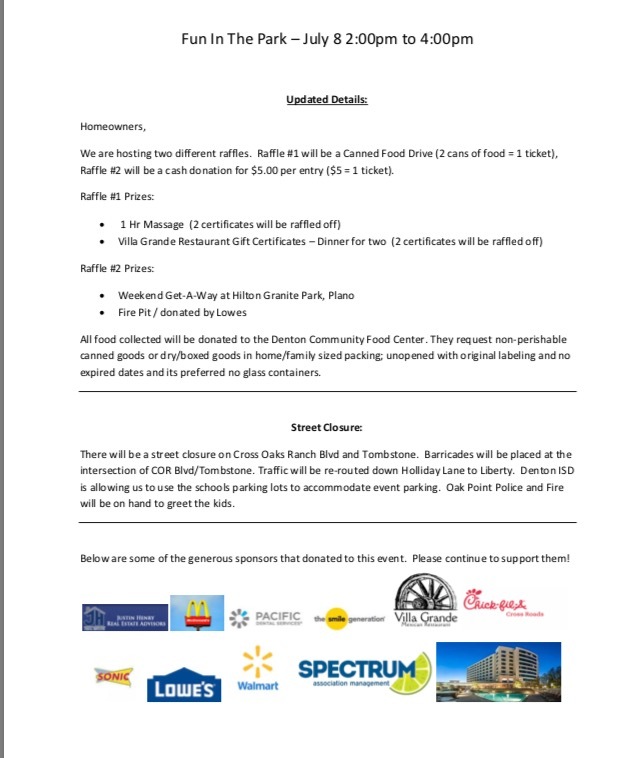 Ruthie's Rolling Café and Kendrick’s BBQ will be available the night of the event for food purchases. There will be free hot cocoa and cookies while supplies last. And best of all, SANTA CLAUS will be making a special appearance between 7:00 & 9:00 p.m. Come on out and take your picture with Santa! There will be an open Board meeting on Tuesday, November 29, 2016, at 7:00 p.m. Meeting will be held at the Cross Oak Ranch Elementary School Cafeteria. Please click on the link below to view a copy of the Agenda with attachments. Have a wonderful Thanksgiving holiday. There will be an open Board meeting on October 26th at 7:00 p.m. Meeting will be held in the Cross Oak Ranch Elementary School located within the community. This meeting replaces theTown Hall meeting which has been cancelled. You may view a copy of the agenda by visiting the HOA’s website at www.crossoakranchhoa.com. The next community garage sale will be Saturday, September 24th. Start cleaning out those closets and garages and get ready to join in with your fellow residents for the upcoming community garage sale! 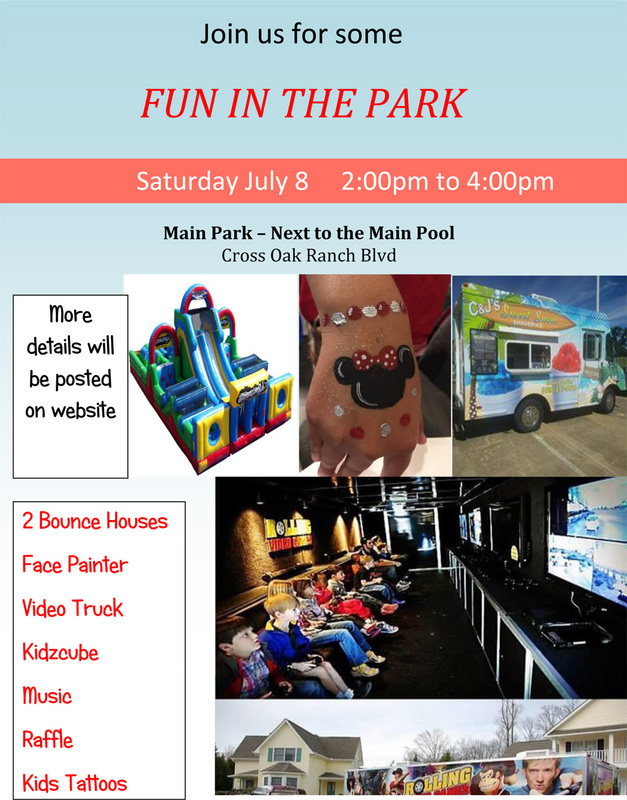 See attached flyer or visit the HOA’s website at www.crossoakranchhoa.com. Open Board Meeting to be held on Monday, September 19th, at 7:30 p.m. Meeting will be held at the Cross Oak Ranch Elementary School Cafeteria. Saturday, September 10th will be Cross Oak Ranch National Night out. Stay tuned for more information as it is made available. Open Board Meeting to be held on Tuesday, August 30th, at 7:00 p.m. Meeting will be held at the Crossroads Town Hall located at 1401 FM424 in Crossroads, Texas. Below you will find a link to the agenda and an informational sheet that outlines the board resolutions up for discussion and vote at Tuesday’s meeting. Cross Oak Ranch is hosting a fun day at Denton Water Works, Saturday, July 16th from 7:30 to 9:30 p.m.
Bring the family and come on out for a day of “water-filled fun”. Due to the weather the Movie in the Park event scheduled for Saturday, May 28th has been postponed. The next Movie in the Park event will be held on June 25th. More information about the event will be sent out closer to the event date. We apologize for any inconvenience. MONDAY, APRIL 18th AT 6:00 P.M.A general meeting of the Board is scheduled to take place on Monday, April 18th at 6:00 p.m. The meeting will be held in the Bloomfield model home located at the corner of Bonanza and Longhorn. Should you have any questions, please contact Spectrum AM at Spectrum Association Management at contact@spectrumam.com. 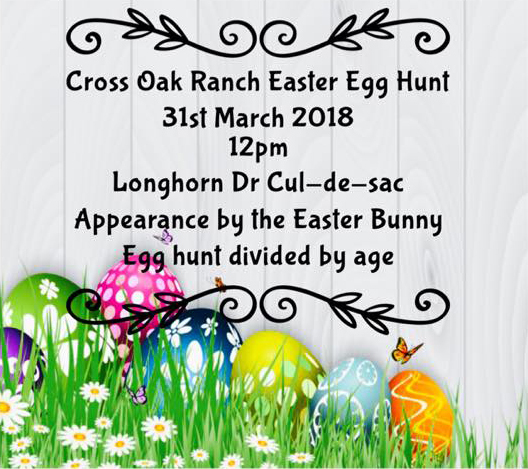 c/o Spectrum Association Management, L.P.
An egg hunt for toddlers to elementary age children will be held at 1:00 p.m. and at 7:00 p.m.
We will have a teenager “glow in the dark” egg hunt. 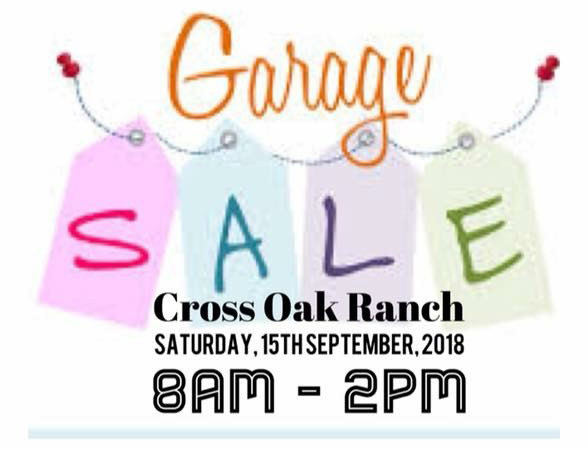 The Cross Oak Ranch HOA Board of Directors is pleased to announce the Community Garage Sale will be held on March 19, 2016 starting at 8:00a.m. Hope to see you all there. Cross Oak Ranch Board of Directors will be holding a meeting On Tuesday, February 23, 2016, at 6:00 p.m.
Meeting will be held in the Bloomfield model home located on the corner of Bonanza and Longhorn. We are pleased to advise you of the Annual Reconvene Meeting to be held on Tuesday, February 9, 2016. The purpose of this meeting is to conduct normal business of the Association and present information on current Association affairs. Check in will begin at 6:15pm. We are looking forward to seeing you on February 9, 2016. If you have any questions please feel free to contact me at 972-428-2030 or e-mail contact@spectrumam.com. Family bingo night! Friday, February 5th from 6:30 to 8:00 p.m. at the Cross Oak Ranch Elementary School cafeteria. Free event for Cross Oak residents and their family members. Due to unforeseen circumstances, the Annual Meeting originally scheduled for Tuesday, December 8, 2015, had to be cancelled. The Annual Meeting has been rescheduled for Thursday, January 14, 2016. The purpose of this meeting is to conduct normal business of the Association and present information on current Association affairs as well as electing officers for the Board of Directors. Enclosed for your convenience is a proxy which can be used in the event that you are unable to attend the meeting. It is very important that you assign your proxy if you cannot attend. If you do not wish to assign your proxy to a specific neighbor or to the Board to vote on your behalf, you may place a check mark in the box next to the following statement, "For quorum purposes only, No consent to vote on my behalf” and you may complete and return the absentee ballot enclosed along with your proxy. The meeting cannot be held unless a quorum is present, either in person or by proxy. Please do not resend Proxies or Ballots if you have already submitted them prior unless you are making changes. Proxies and ballots already sent in will be honored. Check in will begin at 6:30 p.m. We look forward to seeing you on January 14, 2016. If you have any questions please feel free to contact me at (972)428-2030. The Board of Directors will be holding a telephonic Board meeting on Friday, January 8, 2016, at 11:30 a.m. The purpose of this meeting is to discuss the amendment of the Bylaws allowing a lower quorum for the purpose of Board elections only. Please click on the link below to review the meeting agenda or for more information on how to attend. 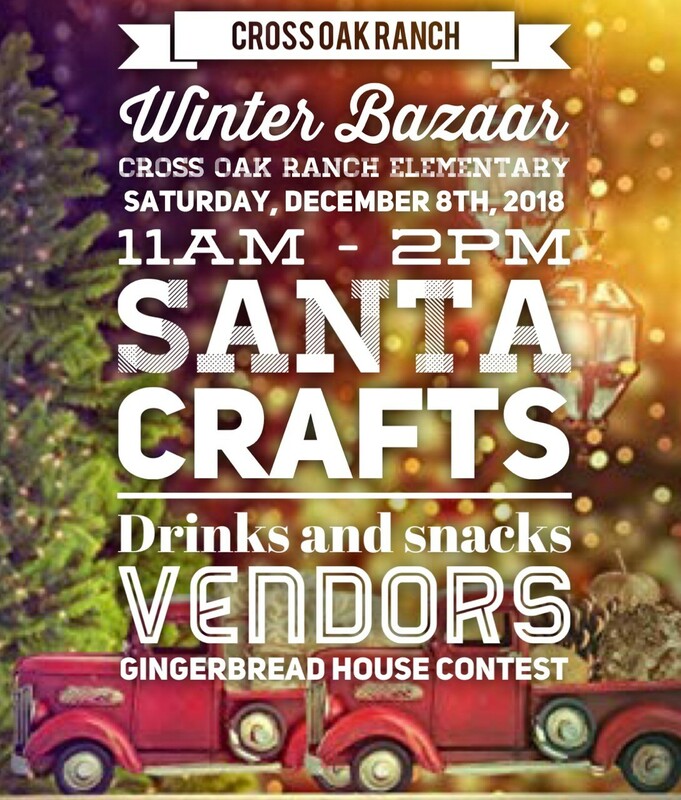 On behalf of Cross Oak Ranch Homeowners Association, Inc.
Come and sing your favorite Christmas songs! Due to water being shut off as a result of a construction accident, the 2015 Annual Meeting had to be cancelled. The Social Committee's next event coming up on September 19th at 6pm which is the Neighborhood Night Out/Block Party. Each street in the neighborhood will be responsible for planning their own Block Party that will be held on that day and time. The basic idea is for everyone to bring their own food, grill out, hang out, meet your neighbors, play games and have fun. To make it fun and easier to meet your neighbors you could even take part in “Pass a Dish”. To be able to pull this off, we are asking people to step up and be a Street Captain. What this means is the Street Captain will go door to door on their street inviting people to come out and participate. If the street wants to pull together to have a bounce house or any other type of special item for the kids/adults then the more the merrier. This also allows us to use street captains as a point of contact for future events, in case of a disaster, etc. I need a person who is going to be available and able to do this. I will be breaking up the longer streets into 2 or 3 sections as it will be easier to handle. Example Tumbleweed has 3 sections, Wagon Trail has 3 sections…. Each section will be separated. Are we allowed to block off the street? No. Per city code we are not allowed to. Who provides the food? Each individual family brings their own food out to cook if you want to share then great! What time do we do this? Each street will start at 6pm. Does the Social Committee pay for the event? No. This is just neighbors coming out to have fun. The Social Committee is looking forward to seeing the community come together even more. If you have any questions please reach out to one of the Social Committee members on our Facebook page. "Cross Oak Ranch Social Committee". • No items will be discussed in executive session at this meeting. Stop by the COR booth for information andgiveaways! Click here to download and read the COR Back to School Bash. However the Committee is looking to reschedule it to a later date, once that date has been set notice will be sent out via email. Experience Disney’s Big Hero 6 outdoors on the big screen with your family and friends. Bring your blanket, chairs and your appetite. 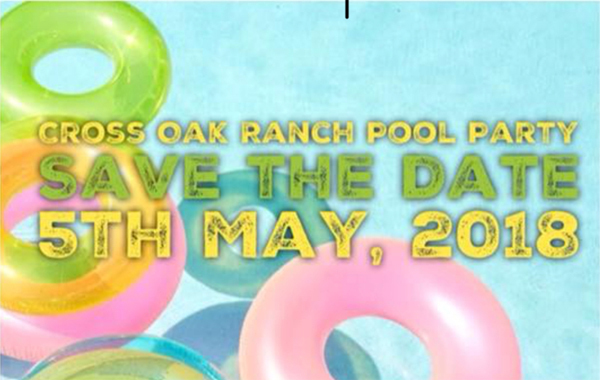 Join us at 7:30 p.m. in the park located on Cross Oak Ranch next to the main pool for Pizza and Popcorn. Movie begins at sunset. After registering, you will receive a confirmation email containing informationabout joining the webinar. Supervision is the best form of child safety. There should always be an adult present when children are near water. Never let them swim by themselves. Designate one adult to watch the pool area at all parties/functions, alternating every 15 minutes. Make sure toys are cleared from the swimming pool area. Learn Infant and Child Cardiopulmonary Resuscitation (CPR) and learn where the emergency phone is near the pool in the event that 911 must be called. In fact, make sure that anyone who is watching your child is certified in CPR and First Aid. Contact your fire department, hospital, American Heart Association or Red Cross for class offerings. Lifesaving equipment should always be available in the pool area and probably hanging from the fence. Ropes, poles and life preservers are most common. Teach kids to swim. Swimming lessons train youngsters on valuable lifesaving skills. They learn how to kick, float, hand strokes and, most importantly, breathing techniques as well as the art of holding their breath while submerged under water. Water exploration enables kids to develop their cognitive and motor skills. Swimming lessons will provide them with all the skills needed to survive in water. Check in will begin at 6:15pm. We are looking forward to seeing you on March 23, 2015. Christmas tree recycling/disposal service will be available for your community. Dallas Valet Trash & Junk Removal will pick up trees from your residence for $15.00 per tree. Dallas Valet Trash will be in your community on January 10, between the hours of 1:00-2:30 pm.Please note that the community will need to have a minimum number of 10 trees for pick up for the community to qualify for the service. If you are interested, please email Dallas Valet Trash at wepickup@dallasvalettrash.com. Once a community reaches the minimum (10 trees), they will reach out to residents individually to finalize pick up details. Lennar Model 9216 Remington Dr. Cookies, coco, and pictures with Santa. Cross Oaks parents, children, and community members are all invited to meet the school office team on Friday, August 8, from 6:00 to 7:00. There will be many new faces at Cross Oaks Elementary this year, including Matt Preston (principal), Katie Hart (assistant principal), Jane Ruffin (counselor), and Noemi Alonso (receptionist). Mr. Preston will read a book to children, and a short activity will follow. Light snacks will be served. Our new Cross Oaks office team is looking forward to serving the community of Cross Oak Ranch during the coming school year. Hope to see you there! Cross Oaks Elementary will be holding its second annual Kinder Camp on Thursday, August 7, from 9:00-11:00 am. This camp is designed to provide upcoming kindergarten students the opportunity to become acquainted with the school and meet new friends. The children will participate in numerous activities, all with Cross Oaks teachers. Snack and water will be provided. Parents, plan to attend from 9:00 to 9:30, and them pick up students promptly at 11:00. Please RSVP by emailing ckoenig@dentonisd.org. ****Please note that this meeting is open for viewing and listening in only. Comments, questions, or concerns will not be addressed at this meeting.